Two accomplished metalsmiths, both with extensive teaching careers, have joined forces to provide a comprehensive survey of the ways to form sheet metal. The 256-page text covers a huge swath, from a basic dapped disk through synclasting, anticlasting and spiculums to a raised vessel. Along the way, special attention is given to anticlastic forming and the vocabulary first introduced by their mentor, Heikki Seppä. 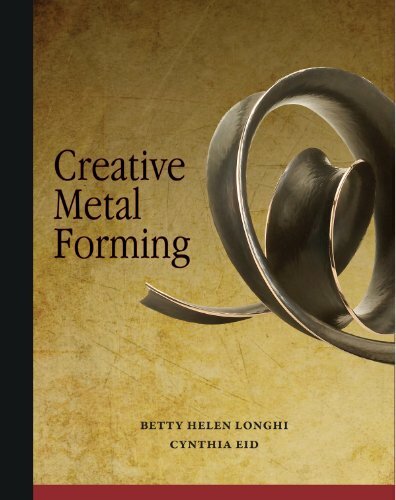 Creative Metal Forming includes 35 detailed exercises to explain the basics and as well as advanced nuances of each category. Metalsmiths Michael Good and Nancy Linkin have each contributed demonstrations of their forming techniques. Selling online since 2001 Brickyard stocks about 6000 titles at any given time. These include new, used, university press, small press and remainders. We've made an effort to stock hard to find titles from small Maine publishers. Address: N Yarmouth, ME, U.S.A.